For new readers, you can find an introduction to the Screwtape for Artists letters here. Excellent work lately, my friend. The Artist/Subject’s vague sense of victimization– our beloved martyred feeling, so handy for invisible destruction– is well under way. The joyous act of artmaking is actually quite difficult to martyrize, but you are doing a good job here. Humans make art under the most horrendous conditions. Art is a pernicious vermin that invades everywhere and is hard to stamp out. Here’s a tip: remember that the coffin of the complaining victim is constructed with the nails of DESERVE. Whenever the Artist seems to move forward with energy, pound another DESERVING nail into that brainpan. She DESERVES a break, a cookie, an afternoon off, a cappuccino, to procrastinate just one more day. Here the DESERVE acts as a somehow “earned” reward. The more DESERVING, the less creating. I am so glad that we have managed to sever the word from it’s original root, which has no “built-in” reward. It simply means to serve completely or fully. The Heroic Artist was very good for our cause in the 20th century: all those tortured men smoking and drinking and screwing themselves to death because they deserved it as artists. In the 21st century the women are taking the helm of the arts, and a new technique for destruction, victimization or the martyr impulse, must be assiduously and viciously cultivated. Letter 1, Letter 2 and Letter 3. 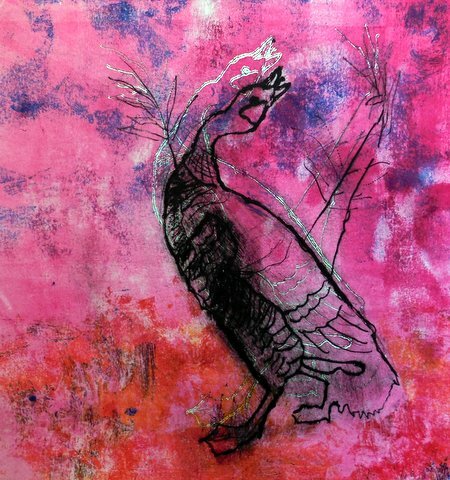 The Goose Game is a series of 63 monoprints and monotypes based on my pilgrimage on the Camino de Santiago. 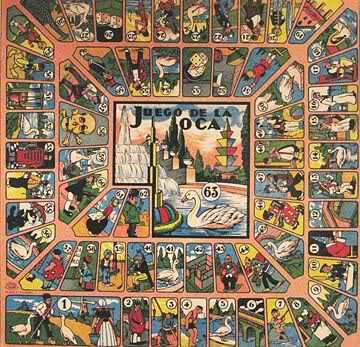 The Goose Game is also a European child’s board game similar to Chutes and Ladders with 63 squares. It may have been a mnemonic device used by the Templars to give illiterate medieval pilgrims a “map” to guide them. Forms of this labyrinth-style board game may stretch back to ancient Greece, where the legend is that Greek soldiers invented it to while away time on the beach during their ten-year siege on Troy. I’m new to monoprint, but I have noticed that it seems to have a pronounced time element embedded into it. Once it runs through the press once, or twice, it is largely fixed, set, done. You get the feeling that each run of the press is a literal compression and limitation of energy, like the joint in a stalk of bamboo. The press bed presents a threshold of before (the roller pressure) and after. In a metaphorical way, each print could be seen as a dream from the “bed” of the press, with traces remaining and fading. We are at a hinge in time right now, the Lunar New Year before the Spring Equinox. This is my post 100, and I hope for a hundred more. I wish you good dreams in the year to come. When I start to think I “deserve” — I try and remember that this is actually a “dis-serve” — a disservice to my self and for those aims, goals and dreams I fancifully entertain. …But sometimes that cookie is awfully tempting….. This deserve thing is nasty because we do need rest, food, fun and so on. We just shouldn’t link it up with self-righteousness. Tricky indeed.